It’s finally become snowy and gray as we’ve moved quickly into winter here in Connecticut (not much time left-yeah!). 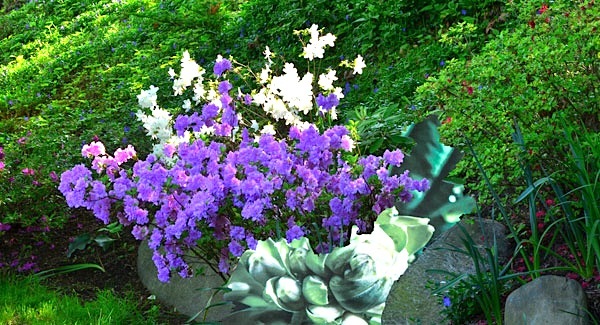 Thoughts turn to sunny days.…Yes, that’s my lovely hosta Classic pillow hiding in the Spring azaleas. On the run again. We’re headed to Baltimore in a couple days for the American Craft Council show-its 40th annual event. Got to get some planning in. Paola Pillows was juried in this year but we chose to wait and check it out first –never been and sounds like a great show. Unlike many, it has both wholesale and retail days so we’ll want to compare turnout. 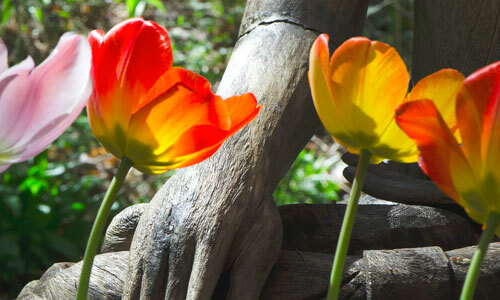 I dug up some sun to share with you: New tulips in front of our Serenity statue who’s currently hiding out in the barn, waiting for warm weather. 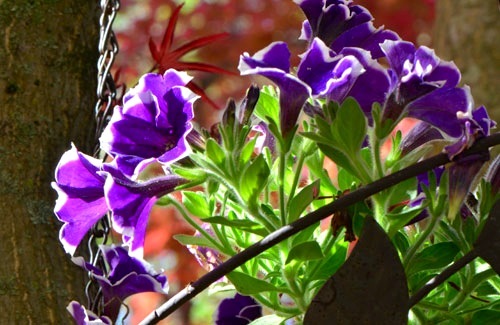 A long -suffering hanging petunia getting her sun under the shade of an old Japanese Maple. 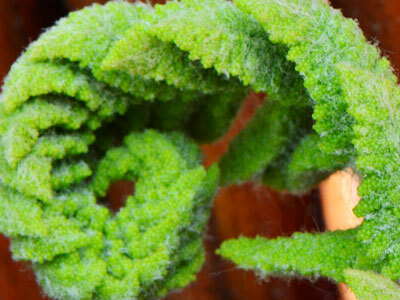 And what would early spring be without young fuzzy ferns popping up everywhere? Music for me has always been the language of love. It has the power to overcome negativity and put you back on track. It’s why I always post music in my blog-to share something that I hope might have special power for others too . I hope it makes your day as happy as it does mine. I first listened to a recording of Mark Knopfler and Emmylou Harris performing Romeo & Juliet and thought- perfect love song for Valentine’s Day. Then I found this version of Our Shangri- La -performed live in 2006. It has that special combination of both introspection and performance that’s so compelling – when musicians are excellent in their own craft and play well with others. From what I observe, Mark has a gift for this. I found it way more romantic listening to all the musicians communicate together that just a duet between two people. And very positive against a backdrop of negative, hateful politicking we’re so easily caught up in right now in 2016. Oops…On a brighter note-at the end of the day…This is us.